Well, this will come as no surprise to anyone who knows me, but to those who don’t…I’ll try not to spend this entire post defending Meat Loaf and Jim Steinman. The tale of my love of all things Steinman began around 1989. I grew up in Alberta, but my mother’s side of the family lived mostly on Vancouver Island. In the summertime, we would take the Plymouth Voyager over the mountains to visit relatives. We only had a limited selection of cassette tapes, and for some reason avoided the radio (likely because on a long road trip, the stations would change frequently). Most of our choices were ‘Golden Greats’ tapes of ’50s and ’60s hits, a couple of ‘kid-friendly’ Disney tapes, and a cassette that had Hooked on Classics on one side and Jive Bunny on the other. However, there was one album we would all sing along to and never got sick of hearing. To cement the concept that Meat Loaf was a big influence upon my musical tastes, consider: at one point my family owned the Bat out of Hell album in three different formats: vinyl, cassette tape and CD. The album opens with the ‘title song’, to a blaze of wailing Todd Rundgren licks, Wagnerian piano chords and free-flying tom-and-crash drums. I really don’t need to describe the song itself in full if you click on the YouTube link…but the impression I always get from that intro is summed up in a word that could describe a great deal of my musical favourites: epic. I find that word gets overused in the vernacular, but in this case it’s appropriate. 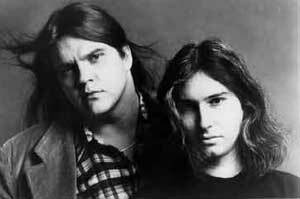 Jim Steinman wrote epic music. Just look at his work with Bonnie Tyler or Pandora’s Box. What makes this song my ‘Number One’ when there are so many soul-touching, world-changing, genre-bending songs out there? Familiarity, and a delight in the simple things. It’s a song that I will never get tired of, and I’ve heard it hundreds of times. I always hunger for new music, but there’s joy to be found in nostalgia. And hey, (yes I just started a sentence with a conjunction; deal with it) 43 million copies worldwide says something. This contemporary review (yeah I pulled it from a Wikipedia footnote, deal with it again) says it best: “It may elevate adolescent passion to operatic dimensions, and that’s certainly silly, but it’s hard not to marvel at the skill behind this grandly silly, irresistible album.” Actually, the wiki article is really interesting if you have a moment. Just like the world’s slow-boil reception to the album, my love for Bat out of Hell grows stronger as time goes on.